Hi! I'm very excited to tell you about this cassette tape of Country Music covers that we've got coming out on Flannelgraph Records this Friday. 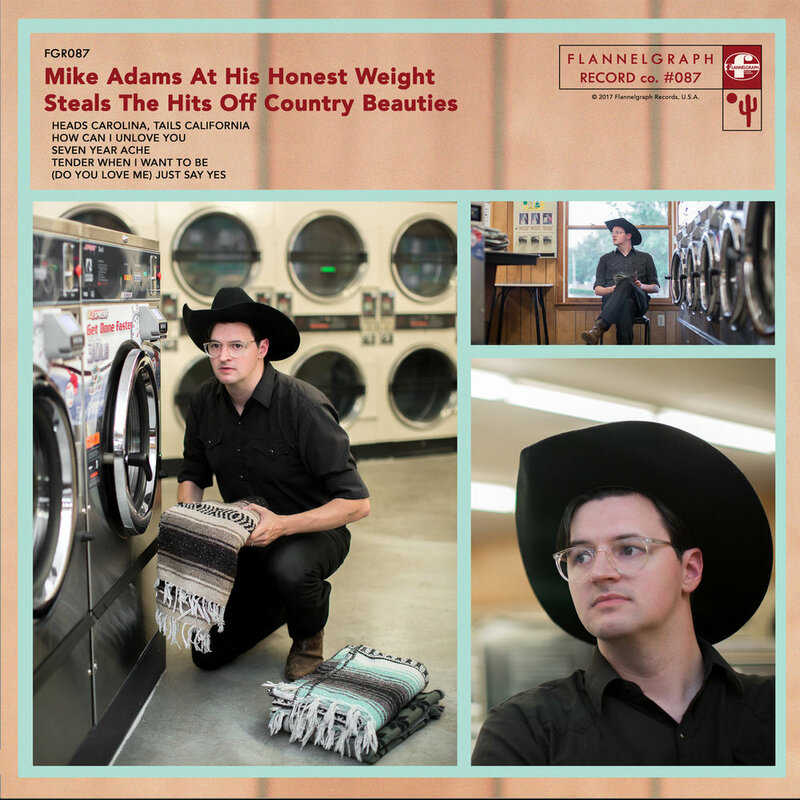 It's called Mike Adams At His Honest Weight Steals The Hits Off Country Beauties, and it's got 5 songs on it. They're all songs that I first heard on the radio, and were written, or made famous, by women who work primarily in the Country Music genre. The reason I chose to record only ladies' songs was actually kind of a coincidence. I had settled on recording a few of these choices when we noticed they all happened to be sung by women. I thought that was nice, so we leaned in to it and used that criteria to narrow down the other choices. I've also always been partial to cover songs that were meant for one gender being performed by someone of another gender. That's fun. Like Ringo singing, "Boys", or my grandma singing "One Day At A Time" in church but not changing the pronouns. Maybe someday I'll record "Silver Wings", or "The Master's Call", or "Saginaw, Michigan", but for now, we're celebrating the ladies! Here are a few words about each of the tunes on this tape, and a link to the original versions. Heads Carolina, Tails California - A now classic tune about greener pastures. This song came out just before I left my dinky hometown to enter high school in the city. I was listening to A LOT of Country radio in the car with my folks back then. It's sentiments about bucking small-town life for whatever comes next really resonate with me and I return to this tune often. It's a bonafide earworm, and I still feel a little excitement whenever I listen to it. How Can I Unlove You - There's a new-ish Country radio station in Bloomington called WDCK. They're great about playing deep cuts and minor Country hits from yesteryear that are somewhat forgotten gems. I first heard this song on that channel while I was driving home from work one evening. I loved it right away. I don't have a sentimental attachment to it or anything like that, it's just a great tune. After about a year on the air, WDCK changed the format of their station to equally as deep-dug Southern Gospel programming. Only a slight bummer. I gave them a call one afternoon and they told me that after Christmas they'd be returning with the Country hits on another frequency (101.1). Thank god! Seven Year Ache - After a few months on the Southern Gospel channel, WDCK returned on it's new frequency, so I jumped over there. I heard this song on that station for the first time and it was another one that sunk it's deep hook into me right away. It's so good! I'm not sure which I like more, the catchy synth melody, or the way the hook resolves on that, "...comes back soon", lyric. Anyway, I was driving home from JoAnn Fabric one Saturday afternoon when I heard it. I quickly pulled my phone and asked Siri® to identify it just in the nick of time before it ended. Whether it's justified or not, I'm not sure, (and perhaps its a modern phenomenon?) but Country Music is stereotypically associated with blind, superficial patriotism and other unsavory, "traditional", ways of thinking. And, WDCK plays some of the worst, most tilted, poorly persuasive F*x N*ws news breaks I've ever heard. They're hard to stomach. So, it felt a tad rebellious recording this tune after, having been introduced to it on their channel, reading this fantastic statement recently released by Roseanne Cash regarding her dad's legacy, and her family's unambiguous stance on American Social Justice. What's up, Roseanne, you rule!! Tender When I Want To Be - Another incredible tune I first heard on WDCK (I'm telling you, their well-mined playlists are great). This song feels like a prayer. The way Mary Chapin Carpenter sings about love here reminds me of the way Carl Sagan talks about science. Though it's complex and over my head, they simultaneously make me feel like I can understand it, participate in it, and be positively influenced by it. Those words, "You don't have to take the whole world on, just be tender when you want to be", have been a real true mantra for me lately. I should also mention, MCC is another stereotype eschewing Country Great who has done all sorts of humanitarian work and left-of-the-dial political writing. (Do You Love Me) Just Say Yes - This was one of my earliest favorite songs, I love it. I was on vacation with my parents last summer when I received the first mixes of my versions from Eric. I showed this one to my dad who immediately started reminiscing about my brother and me singing along to this song in the backseat of the family car on road trips in the late 1980s. It's a sweet and catchy tune with a killer instrumental jam at the end. And Paulette Carlson's voice is gorgeous. I like to think of this song as an innocent celebration of consent and midnight canoodling, and definitely not as predatory coercion. Thanks for indulging me. This is my website after all, so I suppose I can say whatever I want and you just have to sit there and take it. But, thanks for reading and considering it, anyway! 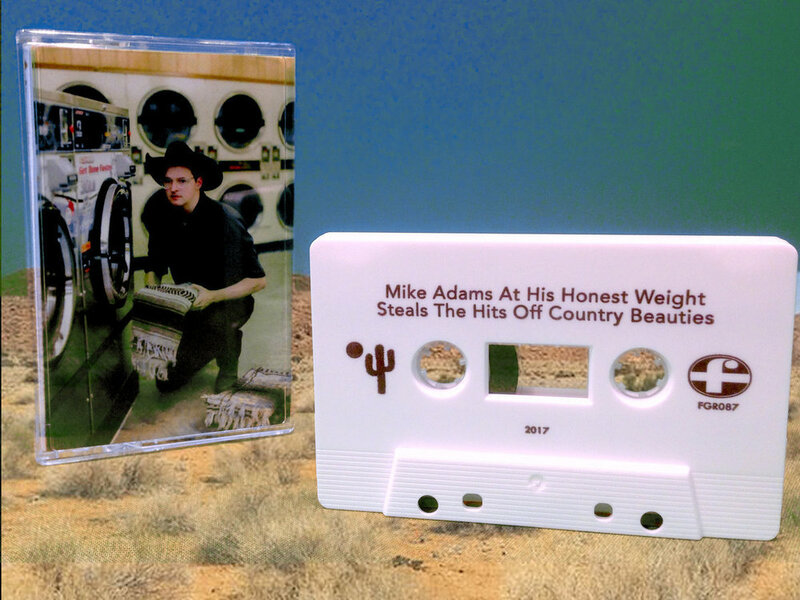 You can pick up the Steals The Hits... cassette from Flannelgraph Records, and there's also a new t-shirt you can bundle it with, too, if you want!